At its peak, in the Middle Ages, Constantinople (Istanbul) was the richest and largest city in Europe. Its strategic position between trade routes also formed a significant religious divide between Christianity (the West) and Islam (the East). 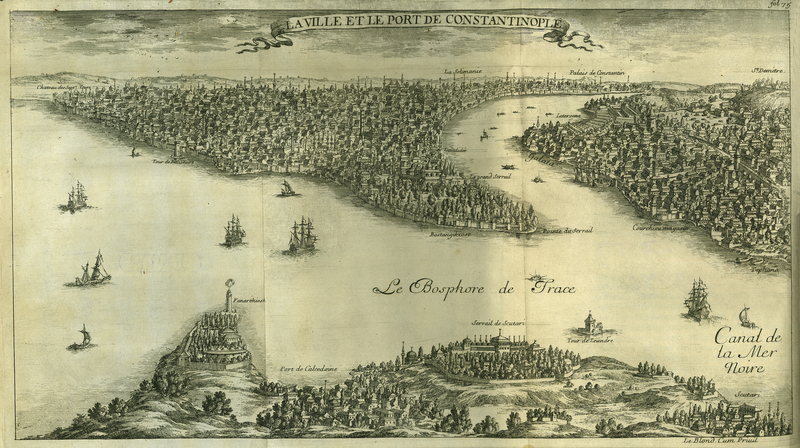 Although named Istanbul (derived from the Greek ‘στην Πόλη’, meaning ‘in the city’ or ‘to the city’) after the Ottomans took possession in 1453, the French traveller and artist Guillaume-Joseph Grelot persisted with the older name. This first edition account of his travels to Constantinople in 1680 is replete with illustrations, leading one scholar – Michèle Longino – to term it a ‘coffee-table book’. Perhaps the first. The engraving of the city, named after the Roman emperor Constantine I, is but one outstanding image of many within the book. [Guillaume-Joseph Grelot], “Relation Nouvelle d'un Voyage de Constantinople,” ourheritage.ac.nz | OUR Heritage, accessed April 22, 2019, http://otago.ourheritage.ac.nz/items/show/10720.